You all loved it so much last year, the Cracker Christmas Giveaway is back again this year. I have teamed up with some amazingly generous people to spoil you with some epic prizes worth over $1000. All of these beautiful prizes would also make great Christmas gifts, so do check out the links I have there for you. If you can support an Aussie small business this Christmas, I know they will just love you for it. Okay, here are the goodies. Enjoy and good luck! Friends Alisa and Danni have mums of Australia in love with them since the release of their 123 Nourish Me products. The feedback and reviews are glowing! 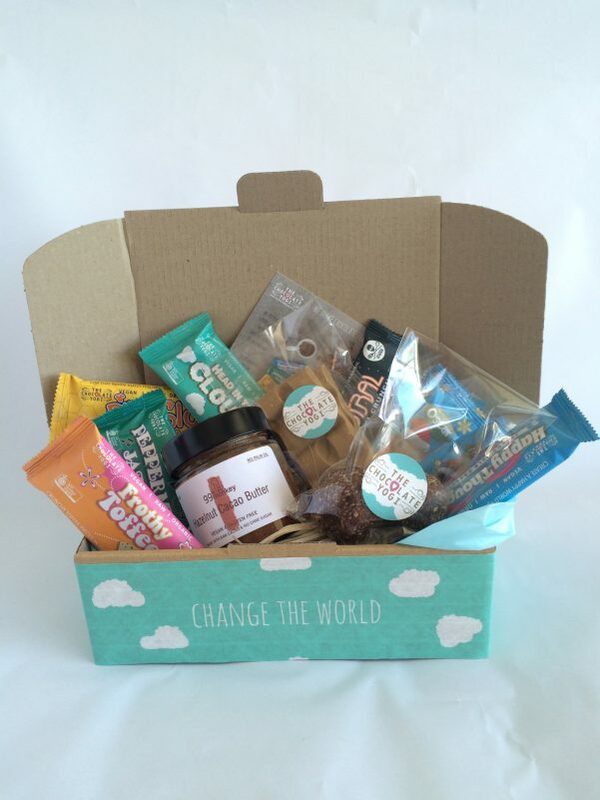 Alisa and Danni have kindly donated a Calm Kids box for one of you to win. 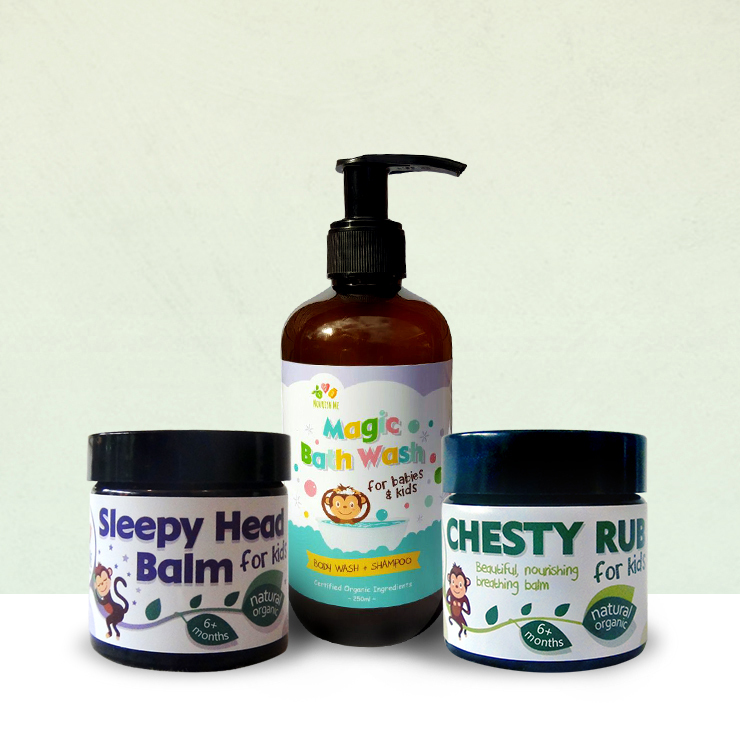 In the box is their best-selling Sleepy Head Balm, Chest Rub and Magic Bath Wash. 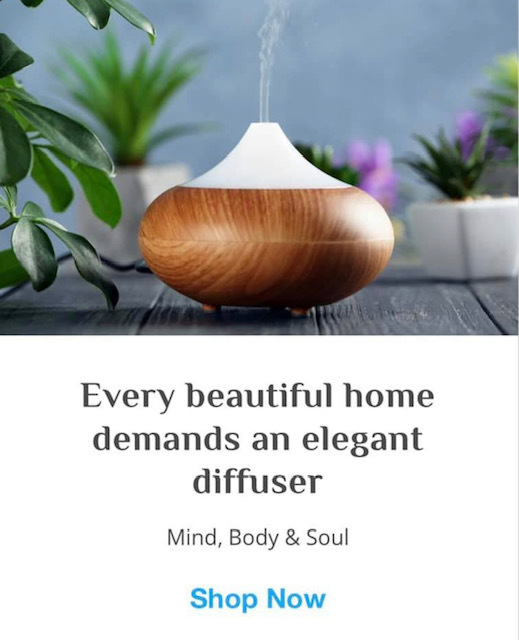 They are made from all natural and organic ingredients including the highest quality essential oils. There are no harsh chemical, petroleum, mineral oils or artificial fragrance. Check out all the 123 Nourish Me products here. I am a huge fan of these two products – Amazing Oils Ugly Bits Stick and Skin Facial Moisturising Treatment. I have raved about them both on the website before. The team at Amazing Oils has changed up the packaging to orange instead of blue but it’s still the same awesome products inside. The Ugly Bits Stick is great for skin tags, blemishes and spots. The moisturiser is one of the best I have ever used and has helped even out my skin tone and wrinkles. Many thanks to the Harold family for giving away one Amazing Oils Vanity Pack to one of you! The hottest pans in town! Solidtekniks are the brilliant Aussie-made and owned iron cooking pots and pans and you can win one of your own. With thanks to Mark Henry and his team, we are giving away a 22cm sauteuse pan. This pan has a lifetime guarantee and will become an heirloom piece. They are a healthy, non-toxic and durable piece of cookware – you can’t wreck this one. Brilliant for all non-stick cooking once you have seasoned it, you can also cook cakes in this sauteuse pan. This essential oils set is divine and makes a very special gift. 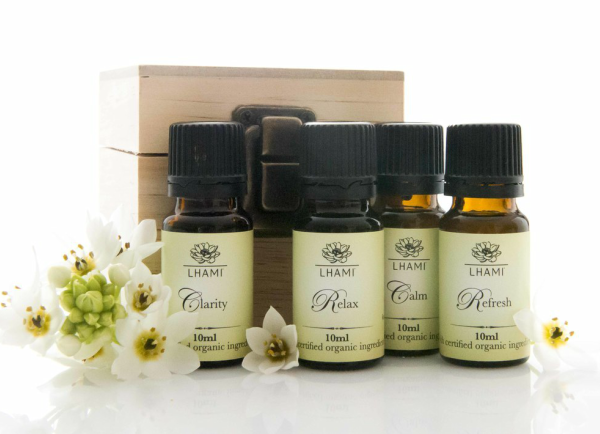 Four beautiful signature blends from Natalie at Lhami including Clarity, Relax, Refresh and Calm all in a beautiful wooden box. They are the purest quality, certified organic oils blended for the aromatic benefits. Get it (on sale) here. How pretty are these rainbow sensory sound blocks? 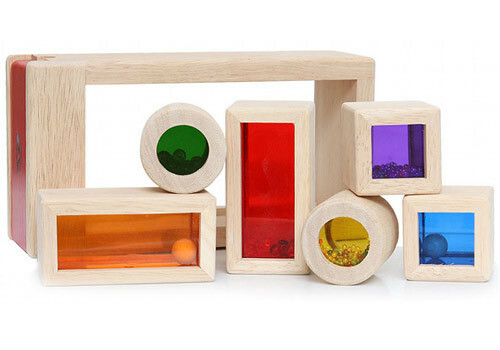 Made ethically from safe materials, these blocks also have colour and sound to engage the senses. Use as rattles from a young age and progress up to rolling, stacking, sorting and building. They all fit together in the outer case so it also becomes a jigsaw. This block set is from the brilliant online toy store, Eco Toys and Melinda is kindly giving away one set to one of you. See it here. Tonia makes such beautiful, non-toxic perfumes! You can win an IME Perfume Collection Pack which is one of everything in the range. 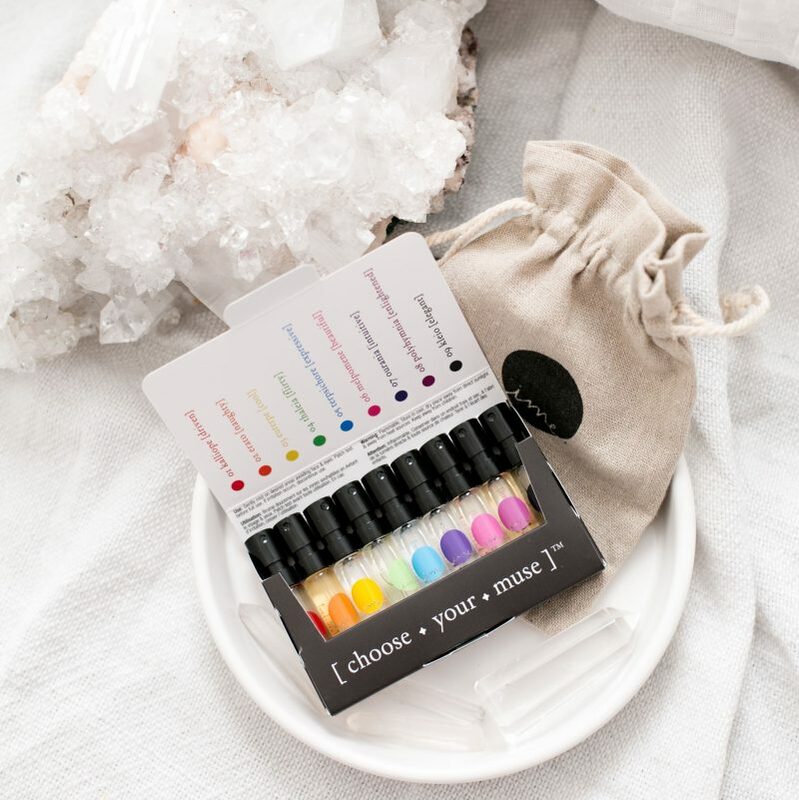 Tonia has a background in natural therapies and is master perfumer and she has designed these perfumes so you can choose by muse, mood, colour or scent. With only 100% pure natural, non toxic ingredients, IME perfume is the perfect gift. 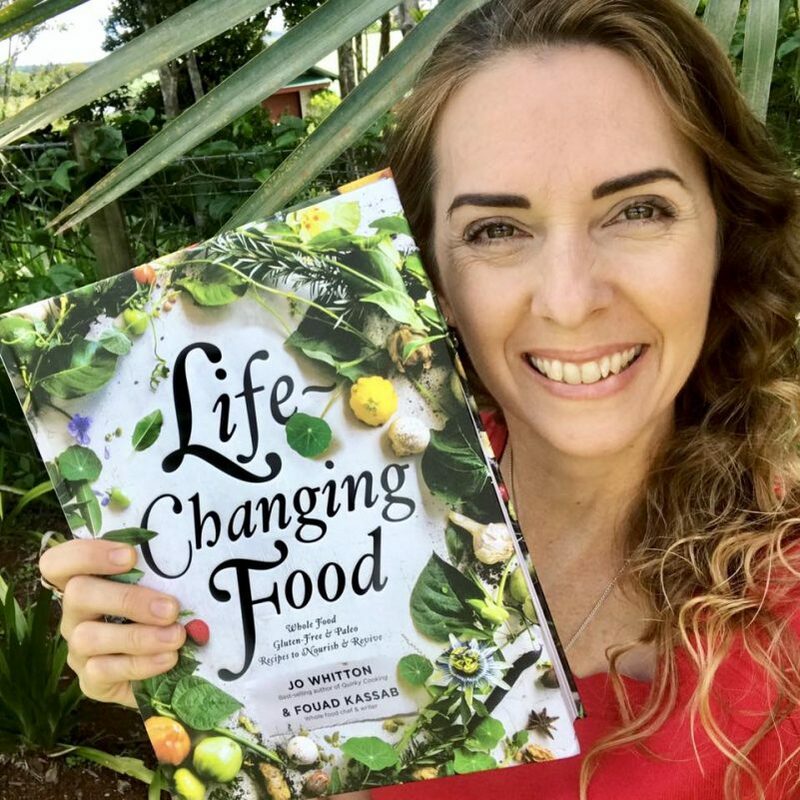 Jo Whitton from Quirky Cooking and chef Fouad Kassab have teamed up to share over 100 of their best whole food recipes. Every recipe is gluten free and most recipes suit Paleo and GAPS diets. 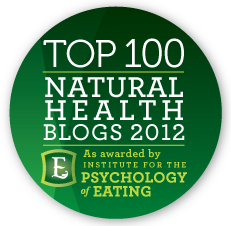 There are dairy-free, egg-free, nut-free, vegan and vegetarian variations where possible and a focus on gut healing foods. It’s a truly beautiful hard cover book with stunning photography and design. I love my copy and Jo and Foo are kindly giving away a copy to one of you. 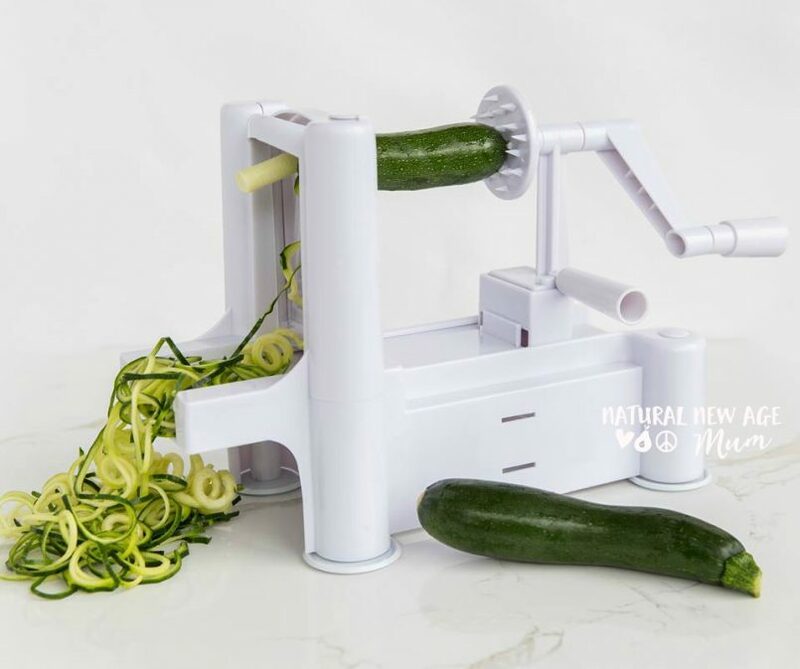 This spiraliser from Avanti is a three-in-one machine so you can make slices and two thicknesses of spirals with three interchangeable blades. There are suction feet and an easy to turn handle that makes it safe and a breeze to use. With thanks to Joanne at Shop Naturally, one of you will be winning your own! Find it (on sale) here. 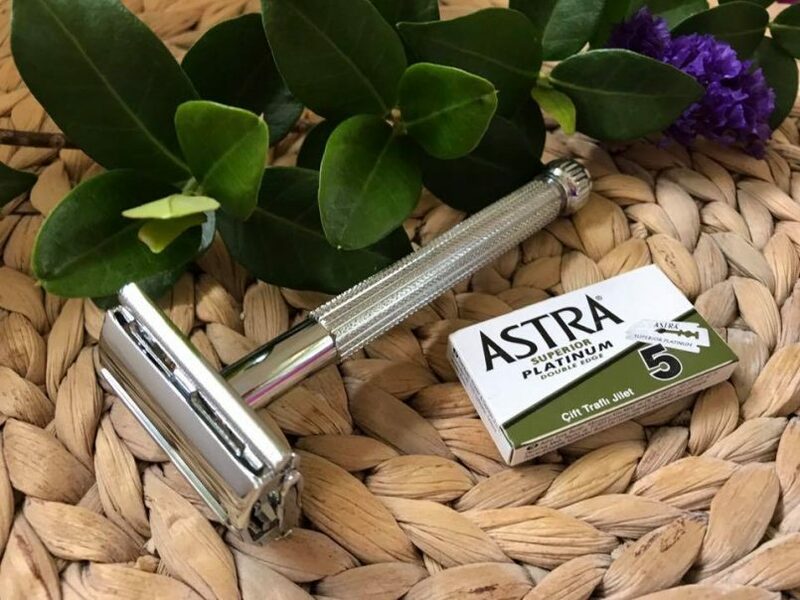 With thanks to Tracey at Biome Eco Store, you can win a Parker Unisex Safety Razor and pack of blades. These safety razors are the stylish way to say goodbye to disposable plastic razors for good! My favourite deodorant! The lovely Erica is kindly giving away three of her natural deodorants to one of you. There are two 70g deodorants and a sample pot of the new gentle bicar- free version for you to try. Packaged in amber glass jars, Erica uses all natural organic ingredients and pure essential oils to keep your pits smelling fresh all day. Karen Murell is a beautiful natural make up range from New Zealand. This lip palette has five lush colours with a lip brush. The lipstick is all natural, nourishing and with long-lasting colour. 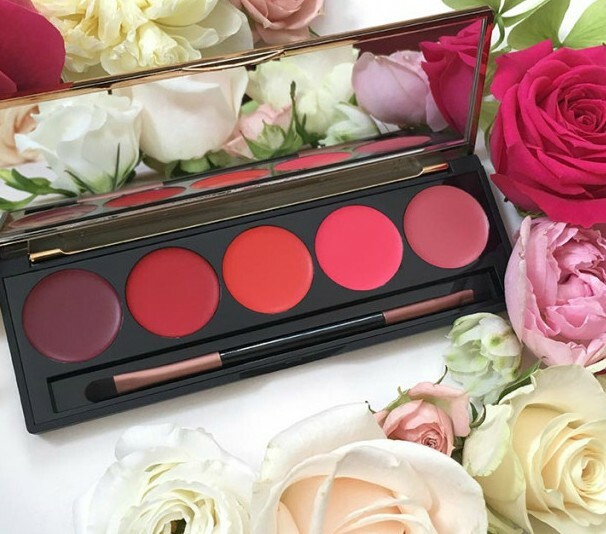 Kitsa at Emporio Organico is your one-stop shop for luxe natural skincare and make up and is kindly giving away this lip palette to one of you! Karina hand-makes stunning crystal jewellery at Karmic Star and she is kindly giving away this Chakra Goddess Necklace to one of you! 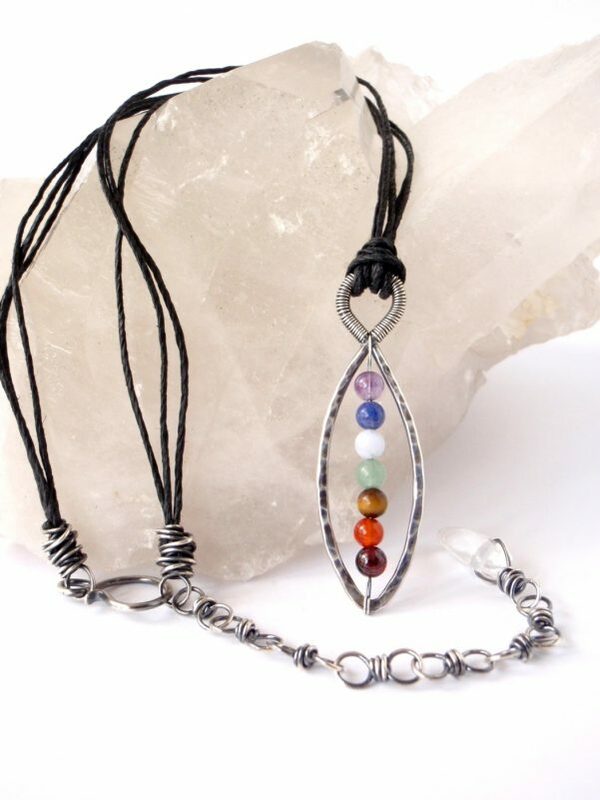 Using 100% recycled sterling silver wire, crystal beads and hemp cord, this necklace signifies the stunning colours of the chakras. Karina infuses each piece she makes with love and positivity. Her creations are cleansed with water, smudged with incense (air), bathed in sunlight (fire), and spends time on her altar to ground (earth). They are then charged under the light of a Full Moon before being released into the world to find their new keeper. Divine! Check out all Karina’s jewellery here. Nina at Beautiful Because has an amazing range of natural beauty products. She is kindly giving away this Eco Tan Glow Pack to one of you. 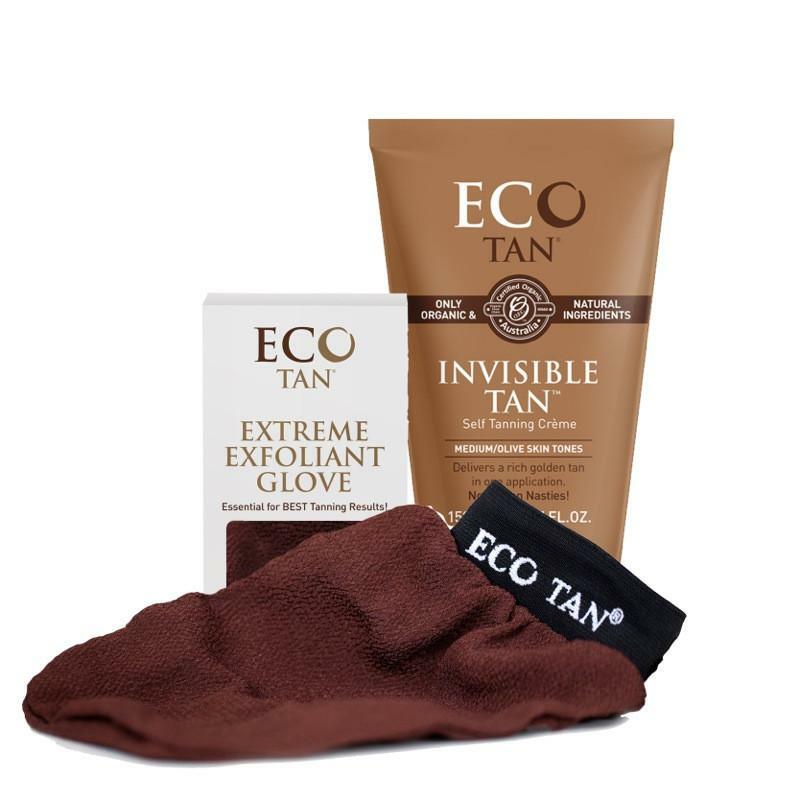 You get an organic Eco Tan Invisible Tan and Exfoliating Glove in a calico bag gift pack. Invisible Tan is an organic moisturising self-tanner that nourishes your skin without any synthetic or toxic ingredients. The Extreme Exfoliant glove will help you prepare your skin for tanning. My daughter uses these products and loves them! Fearsome bottles and lunch bags are stocked exclusively by Julie at Flora and Fauna and she kindly giving away this set. In wolf, leopard, black cat and dog patterns as well as this gorgeous bear. The 500ml bottle is insulated twin wall stainless steel and the bag is made from easy to wash neoprene. What a cute way to be eco-friendly and fight the war on waste! 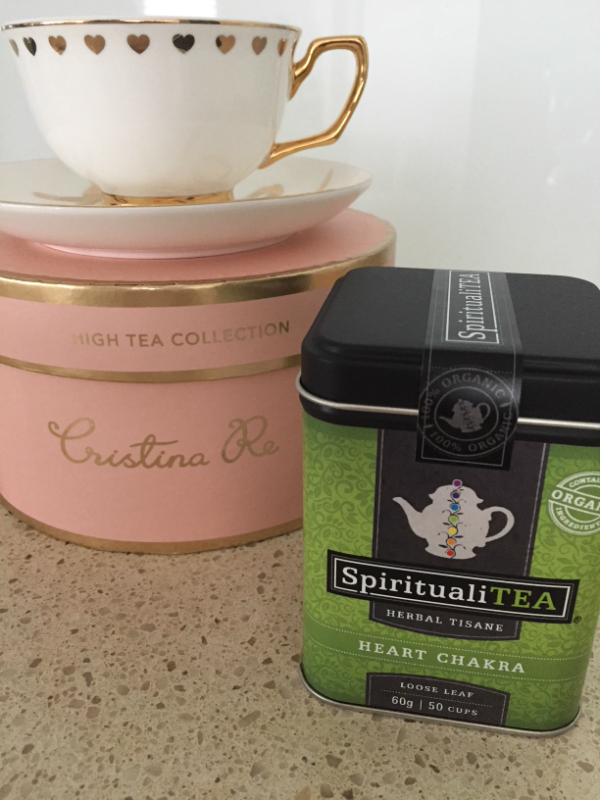 Naturopath and Herbalist, Cheryl Brady has formulated an amazing range of SpiritualiTEA chakra herbal teas. She is kindly giving away a tin of the Heart Chakra green tea and this bone china, gold plated LOVE tea cup and saucer. You have to go and have a look at her shop!! As well as a gorgeous tea for balancing every chakra, there are some stunning tea cups and mugs that make brilliant gifts. The Chocolate Yogi are kindly giving away this Chocolate Lover’s Hamper to one of you!! Everything is vegan, gluten free, dairy free and soy free. Malindi has put together some awesome hampers for Christmas, starting at just $16.95. They all come with a gift box, gift card and a no-melt guarantee insulation. With donations made to Sea Shepherd and The Orangutan Project, eating this chocolate is an extra feel good experience. Check out all the hampers here. Never miss a thing at Natural New Age Mum. Get the weekly newsletter here. This giveaway finishes on Sunday the 10th of December at midnight AEST. The winners will be chosen using a random number generator from those meeting the entry conditions. There are 16 prizes to win and there will be 16 winners. Prizes are allocated to the winners randomly. Please provide a current email address when you leave your comment (not made public) so I am able to contact you when you win. Sorry, only those with an Australian residential address are able to enter. Good luck! My favourite Christmas tradition is putting up the tree with my kids. So many of our ornaments have special meaning, including photos of Grandparents that have passed and baubles made when the kids were little. This is such a great list of prizes! My top four picks would be the Solidtekniks Sauteuse pan because I’ve been following them for a couple of years, dreaming of owning one. The Karmic Star necklace because my family loves crystals. 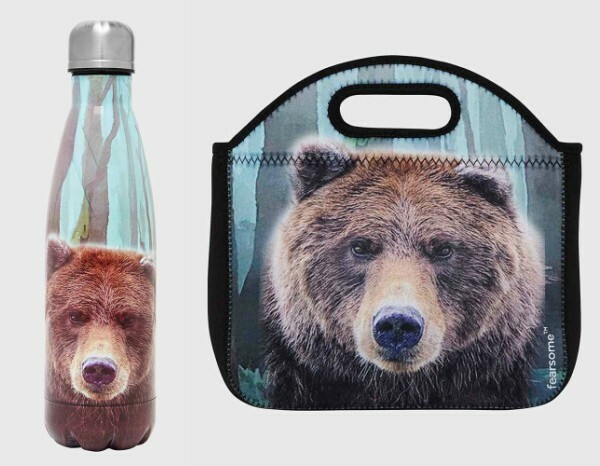 The Fearsome Bear lunch pack because it would be great for my daughter. The SpiritualiTEA pack because it’s just adorable! Thanks and Merry Christmas! I can’t leave my own comment for some reason, but here you go! Our favotite Christmas tradition goes back a long time. On the weeks of December leading up to Christmas ? we always make our traditional German cookies which we share with our family and friends. Christmas has always been a magical time for me, and I love re-creating and adding to that magic to our children. Out of everything though, the most important thing is spending time with each other and appreciating all we have. Emphasis on the gift giving, giving freely because we want to, not because we expect something in return. I hope my boys get a greater sense then just receiving gifts from this time of year. All prizes are lovely the winners will be lucky to get which ever! I have two sensory kids so the blocks are awesome ? The Razor from Biome to save on all those disposables we use! Life changing cookbook-I’m gluten free, sugar free vegetarian so cooking isn’t always easy! And I have to put the yogi chocolate in there too, because it’s absolutely yummy-and probably my favorite dairy free chocolate ever! My kids adore it too! We really don’t have a family tradition anymore, but I do remember looking forward to my mum’s special potato salad she made every Christmas when I was growing up, never was able to make it so good. Now we always eat less and go for a family walk on the beach. Every year on Dec 1st we put up the Xmas tree together playing Xmas music. It’s so fun! Xmas day before we have lunch we all sit down around the Xmas tree and since I was a little kid I give out the presents to everyone one at a time and we watch everyone open their gifts. Then it’s lunch time!!! We empty our “Gratitude Jar”. All year we write about the funny, amazing or heartwarming things that have happened to us or that we have done for someone else. It’s great to end our year on a positive note. Shared to Twitter- Merry Christmas NNAM! my favourite Christmas tradition is having a couple of scorched almonds for breakfast. We have done it since I was a kid, and I have carried it on with my kids. I’d love to the win the deodorant pack or the saucepan. In our family the youngest person present always puts the Angel atop the Christmas tree when we decorate it. On Christmas morning the oldest person present always plays “Santa” handing out the gifts from beneath the tree. Traditions are all important. One of the many great things that happen when you become a parent is the ability to make your own Christmas traditions. So far we have a collection of Christmas books that gets pulled out in December and we read them every night. Putting up the Christmas tree with grandma is one of the kids’ favourite traditions. And because my husband comes from a big family every Christmas is a very big gathering with probably close to 20-25 kids, my kids love it. Family tradition is “Mickey’s Christmas” on Christmas eve! Christmas tradition – When I was little my Dad took me in to the TV station he worked at on Christmas Day – just to check up on his staff (but I guess it was a good look to have a little kid there). Now that I’m all growed up – its decorating the tree with the kids (with some Christmas toons on in the background). Also its a HOT TRADITIONAL TURKEY ROAST on Christmas Day – always, no matter the temperature – cause we all LOVE it! (with my bottom lip having a little wobble over the Chocolate Hamper; the Lhami oils; the tea and the Bear and well, anything else on the list would be A-MAZING! My favourite Christmas tradition is putting up our tree. We have a live Norfolk pine that we nurture through the year. We have ornaments from my childhood and my daughters and I make a new crafty decoration every year. We would love the sensory blocks, or the solidteknics pan. Our Christmas tradition is going to the Boxing Day Test! My families tradition is to travel interstate to visit my 97 year old Grandmother and spend time with her while having a beautiful Christmas dinner. This year we will be breaking that tradition and staying home, haven’t been home for Christmas in over 5 years. It means a grandmother visit will have to be celebrated earlier this year. I love the solidtekniks sauteuse, the chocolate yogi hamper, 123 nourish me calm kids, who doesn’t want calm kids ! And the amazing oils pack. Thanks for introducing these products. We don’t have much of a Xmas tradition other than decorating the tree and house all together. These prizes are all amazing! I would love any of them. But if I had to pick I would have to choose the solidtechnics pan, the chakra necklace, the spiraliser and the chocolate! I would pick Jo’s book too but I already have it! My favourite tradition is driving around to look at Christmas lights on people’s houses. I don’t light up my own house, but it’s fun to look at how much effort some people put in. It’s something we do as a family, can be done in pj’s, and takes very little energy if you’re not the one driving! In our family it is a big BBQ breakfast with seafood and salads followed by presents. Then the children go off to their partner’s families for the holidays. I do love to hang on to some of our European traditions- my kids have just outgrown these but I used to make an advent calendar and also put out their boots for St Nicholas on the 6th of December to be filled with nuts, apples, oranges, some chocolate and maybe a little gift. The share buttons aren’t showing for me but I will try againt tomorrow I promise! My favourite tradition is Christmas carols with the whole family (as many of them as we can get to!) and driving around looking at all the Christmas light displays people do! Ooh Christmas I love this time of year ?? Wow Sonia, thanks so much for playing Santa! A Christmas tradition we started since we moved to our little piece of heaven is going on a Christmas walk. We take our two young daughters off on a stroll in nature somewhere after we open our presents under the Christmas tree. Christmas eve we drive around looking at all the Christmas lights, watch the rest of the carols before bed. Then usually a family lunch on Christmas day. Thanks for the chance, I don’t have any preferences if I was lucky enough to win all prizes are amazing. My favourite Christmas tradition has always been driving around and seeing the Christmas lights in our area, but this year we have also go into the Christmas spirit & are starting our own collection of lights to decorate our place too. Watching the carols on TV on Christmas Eve, thinking the child should be in bed so Santa comes, but wanting us all to watch till the end. Our traditionis to make swedish limpa bread and swedish meatballs. Eat while we watch the ‘old’ classic movies.. I am from Canada and where I grew up here wasn’t much to look forward to during those winter months so we went over the top decorating for Christmas with mostly handmade decorations. Now that I live in Australia we make sure we get out for a ride on our mountain bikes in the forest at some point on Christmas Day. Not many people out on the trails so it is wonderful for our little family! Christmas isn’t about the presents or even the meals for us. It’s about getting out and having a fun experience together as a family. Thank you for the opportunity to win these awesome prizes! They are all amazing!! My favourite Christmas tradition is fairly new in our family, but we do a Christmas Eve box. It includes new pyjamas for everyone, some reindeer food and an activity to do together like a new christmas book to read or movie to watch or game to play. It means we all spend time relaxing and enjoying each others company on Christmas Eve, rather than panicking, stressing, and rushing to get things done! One of our Christmas traditions is to celebrate both 24th and 25th, because my husband is German and in Germany, the main event is 24th, unlike for me (Scottish, so 25th). So we have special food in the evening on 24th, and Christmas music, and open gifts from family in Germany, plus one other present each. Our family tradition happens on Christmas Eve and started when I was a child. We have a family meal which always features fish. Santa (was my Grandfather now my Dad is the Grandfather) makes an appearance (sometimes with a reindeer in tow!) and with the helps of the littlest members of the family gives out presents we have bought for each other. Our Santa presents have to wait until Christmas Day. P.S Forget to add my wish list. One of our traditions when I was young was to decorate the Christmas tree on Dec 1st and it is a tradition I continue with my own young kids now. It means we are able to enjoy the twinkling fairy lights throughout Dec and in the lead up to Christmas Day. I am grateful to have a chance to win any of the above prizes. Thanks Sonia! My favourite memories of Christmas involved my grandparents decorating their house, making Christmas biscuits and cake with my Nan and the love and generosity they showed every single year. The had a lot of heartache after surviving WWII and then losing their 2 eldest sons in separate accidents. Yet they still brought joy and love to their grandkids at Christmas time. Unfortunately they didn’t get to meet their great grandkids but I am using their generosity, love and joy as their legacy to pass onto my children at Christmas. So many amazing gifts, I would be so grateful to receive any of them. We spend Christmas alternating between mine and my husbands families, which is lovely, but we have started our own family tradition of having another celebration day just before or just after Christmas where it is just my husband, two boys and I and have our own ‘mini’ Christmas. Loving it. Before presents and food we write our goals/thungs we grateful for on cardboard hearts for the coming year. Each year we review and share if we want. Solidtekniks, amazing oils, sensory blocks, perfumes. Not so much Christmas traditions but if we are home on Christmas morning we do ham sandwhiches or mango smoothies. And Santa must bring a game that the family can play on Christmas Day! Every Christmas Eve the Nanna in my family reads ‘The Night Before Christmas’ to all the children, I can remember being read to by my Nan. It’s a lovely tradition that the whole family gets in on, even though it’s meant for the kids, the big kids(grown ups) gather around Nanna too. Our Christmas tradition is to make gingerbread men with the kids on Christmas Eve and then eat them all Christmas Day! all wonderful prizes and i would love any of them (but if i have to say which ones really call to me they are the life changing food cookbook, lhami essential oil set, karmic star chakra goddess necklace, fearsome bear bottle and lunch bag . What amazing products all of them are so nice. Our family tradition is a Christmas Day picnic. All the kids and grandkids, mums, dads come together and all have a wonderful picnic. If it rains we have an indoor picnic. One of my favourite traditions is the big traditional roast dinner my family does on Christmas Eve. We then watch the carols together & open one present each. We wait & watch each person open their individual gift. I love it because we truly make it about the magic of being together. Our little family has lived around the globe so the most important thing to us is that we spend it together. Our tree is full of special baubles from our travels and those things that are important to us like a shiny pair of ballet slippers and ones handmade by indigenous peoples. But we would be delighted for the opportunity to win any ? Traditions have come and gone, some just lost, over the years with broken families, blended families, the passing of elders, interstate moves, living away. I have carried on the tradition from my side of putting the Christmas tree up on the first and from my partners side of new pj’s on Christmas eve. It’s the little things huh ? We started a tradition whe my kids were tiny to drive around finding the best light display in town on Christmas Eve. They are now 25, 23 and 12 but still haven’t outgrown it. We are just starting out with traditions with our small family- getting out the Christmas books has been the highlight for our boys (as we put them away after last Christmas). So they are loving reading many variations of Christmas stories/characters and role playing with santa sacks and snow shovelling! On my side of the family, a sweet tradition we have is taking turns handing out the presents and watching people open them rather than all tearing into them at once. A bit more peaceful and a chance to savour and appreciate the moment. 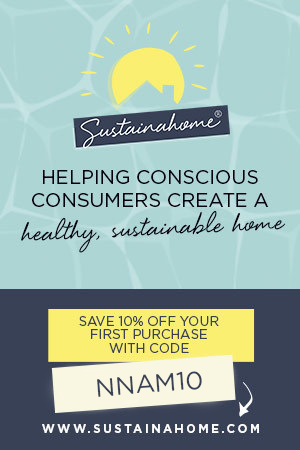 I would love the amazing oils vanity pack, the saucepan, the spiralizer, the cookbook, the bear bottle and bag, the natural perfumes, the essential oils, the eco tan pack, the sensory blocks,the chocolate hamper…. whoops, is that more than four!? ? One of Our Christmas traditions is that when I am making the Christmas cake, every family member (and any visitors who might be over) have to have a turn stirring the batter. This is for good luck! The prizes are all wonderful, but my top 4 would be the Solidtekniks pan, the Avanti Spiretti, the Erica Brooke deodorant and the 123 Nourish me box. Our family Christmas tradition is driving around and looking at the Christmas lights and putting up our Christmas tree. I am also looking forward to starting new traditions with our first child next year! I would be so happy with any of these wonderful prizes! Our tradition is making aussie versions of traditional Christmas recipes for our warmer weather, like Christmas pudding ice-creams for example! I grew up in a family that never celebrated Christmas, so coming up with traditions for my own family is hard! One thing we have done for the past three years is to have an advent wreath on our dinner table that my husband made. We light the candle(s) at the beginning of the meal, read the scripture/devotion and at the end of the meal we blow out the candle. 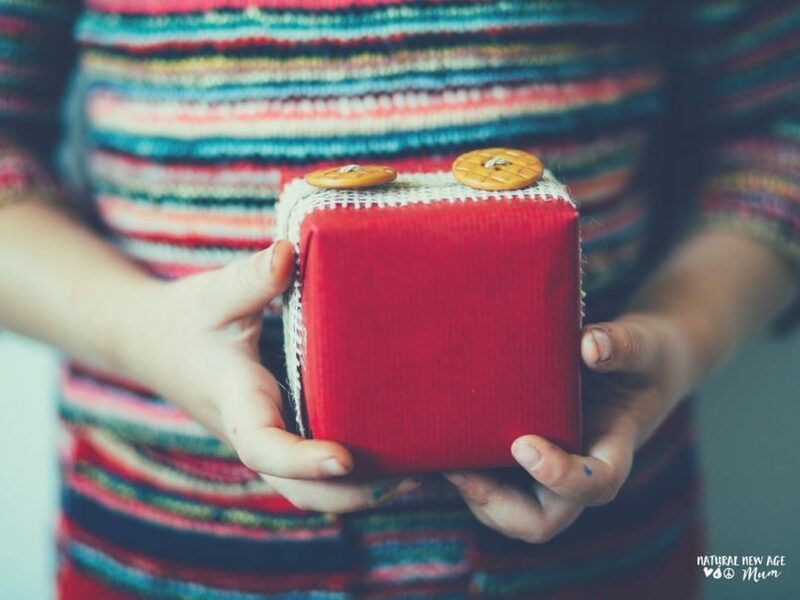 We give minimal presents and really try to focus on Jesus as the ultimate Gift. I love the coloured music blocks, the razor, spiraliser and the Llami essential oils! Thanks for the opportunity to win these prizes! The only tradition we have is putting up the Christmas tree together and inviting a few friends without somewhere to go for Christmas lunch. My top four preferences would be the 123 nourish me pack, amazing oils pack, rainbow sensory pack and Life Changing book. Thanks again! Our family Christmas tradition is a big lunch with all the trimmings and all the families come together. I’d love to win anyone of those prizes they all look amazing and I’d use them all ? Now that we have a permanent forever home, we will be starting to redo our traditions! We love doing Santa Sacks for the fun little things that keep the kids occupied until I am able to get up and going (chronic illnesses) then spend the day as a family with a special meal and treats. To finish off with everyone filling out a yearly What I Did/Liked This Year page for the kids memory books! We would be blessed with any of those simply wonderful prizes to be honest! Wishing everyone a blessed year! The kids help make Gingerbread Christmas Biscuits with their Grandmother using her mother’s special recipe. Icing and sprinkles everywhere but everyone has fun. We always play board games on Christmas Day and until only a few years ago had four generations all playing together! Our Christmas tradition is putting up our tree together. As hubby is away about 9 months of the year for work, we always wait for him to be home to put the tree up. Our kids love it! What amazing prizes Sonia! We have made lots of traditions with our kids – the always going up on 1st December, reading a different Christmas book each night, driving around looking at Christmas lights and giving a gift at the Kmart Wishing Tree. And I still make my traditional Christmas cakes to give to my Dad and a few friends even though being gluten and dairy free I can’t eat them myself! When I was a little girl, my nana handmade a felt leprachaun which we have used over the years as our mishievious elf – long before it became a ‘thing’. My son is now a teenager, but we still insist on taking turns to outdo each other in getting ‘Jimmy’ into all kinds of strife! On Christmas Eve, we sit down around the table and do a puzzle, which more recently has turned into completing one of the lego sets from their Christmas series. We start scoffing lollies, telling tall stories and having a laugh or two. We are a very small family, but enjoy coming together to share our time and make more memories. * Chocolate Yogi Chocolate Lovers Hamper. May the new year bring you an abundance of love and happiness. We have a young family (4,2 and 3 months) and are starting to make our own traditions this year. Tomorrow we are heading into the city to see the Christmas windows and meet Santa! Followed by dumplings in Chinatown. Very excited for a great day. When growing up, every year we used to get known Christmas presents in our stockings. This included a calender, coloured pencils, coloured popcorn and underwear. It is nice now that we are older to have sweet memories. I have a 6 month old so would like to establish a Christmas tradition for my new family. We’ve started what we hope will become a new tradition for our family (of 4, two boys 3 and 6): Secret Santa where we make a gift for the person we pick out of a hat. Lots of fun so far! what a fabulous line up of prizes on offer, thank you so much for working to make this possible for whoever wins;-). I’m sure that there will be some very happy grinners this Christmas. Traditions here have changed to suit whoever spends Christmas with us lol as we have had people from interstate and overseas for years. Now We are moving up that age ladder and our family is spread far and wide, we have much smaller Christmases. This year it’s one grandchild and 4 adults plus us. One tradition that has remained is the putting the Christmas tree up party. We have a tree inside that gets the gloss on it and a live tree is purchased and the kids have a day of crafting decorations, eating and drinking. This year the adults will sit around outside making decorations with missy 6. This is the one day of the year that a soft drink is allowed along with some sweet treats, crisps and healthy home made goodies. However, I find that so much fun is had doing the decorations and getting all glittered up etc that not much gets eaten. We usually do the party after lunch and it’s there for a couple of hours then cleared away so we can decorate the tree with all the handmades. My children did this when younger and the grandchildren also have done it. The tree stays up for the duration of their stay regardless and then gets dismantled after they are gone. Santa comes in the morning to the children and then family gifts from under the tree are given out after lunch and before deserts as everyone is generally too full and needs a break from eating. We do a Christmas Eve box (bag), new pyjamas, a book, and a ornament for the Christmas tree. When he gets a little older we will look at adding a movie as well. Every year since 2003 my husband and I make a giant cookie tree which we eat together throughout the month. It’s one of our favourite parts of Christmas. I love all the prizes but I really like the veggie spiralier, essential oils, nourish me kids box and safety razor. We love putting up the Christmas tree with all the ornaments collected over the years. We love making homemade decorations. The kids love the mess and are proud seeing their decorations when they are put up. All the prizes are excellent and any prize would be a nice surprise. Family get togethers are our favourite tradition. Its all about the lead up fun…Singing great-grandparents some carols, making a wish on xmas cake, drive by lights tours, carols at the beach, Pop’s famous prawns on Christmas Eve. So lucky we can share experiences with family. Thank you for all you do for the NNAM community Sonja. Your website is our “go to”guide. Love love your posts xo Merry Xmas! As a blended family we have taken on my Norwegian traditions of celebrating Christmas Eve in our home. That way the kids get to properly celebrate Christmas in both their homes without rushing from one place to the other on Christmas Day. Also, because we don’t have any extended family here we let the kids chose what special foods to enjoy. All about the kids! It’s hard to chose four, but top if the list would be solidtekniks, essential oils pack, life changing foods and the spiraliser. My favourite family tradition is putting up the Christmas tree with the kids. We listen to Christmas carols and all help put it up. It’s great fun. I would be over the moon to win any prize, they are all so amazing! We have an advent calendar which we open daily to discover a family activity to do together. Also my yearly Christmas present for my parents is a personalised photo calendar. We didn’t have much growing up so every Christmas we would make gifts to give to our family members. Homemade cards, jewellery, biscuits, paper flowers or painted wooden boxes filled with sweets. Some of my fondest memories are crafting with my siblings. Now I have my own son we are doing our first crafty Christmas gifts this year, painted photo frames. We like to put the tree up together and try to make a few nature based xmas crafts together. They are some amazing prizes! Oops I did 5 haha..that’s what happens when you get distracted AND excited! My favorite Christmas tradition has always been the tree, this year it has more significance as my Grandmother passed away this year, and I realised how much of this tradition has her spirit in it, she was very crafty and many of our decorations, she made. This tradition feels so important and special to me as I have my first Christmas without her. Growing up we always had Christmas pudding while watching carols by candlelight on Christmas Eve . I do it now with my family and it always gets me so excited and in the mood for Santa’s arrival. Watching Home Alone 2 with the family Xmas Eve. Number 1 gift would be SOLIDTEKNIKS 22CM SAUTEUSE PAN, the chakra necklace, Karen Murrell lip palate or Lhami Essential oil kit… thank you! Summer evening walks around the neighbourhoods to look at Christmas lights. Having the whole family come and share beautiful waffle and summer berries breakfast we exchange presents the kids wide eyes at their christmas presents such a special time. Soildtekniks 22cm sauteuse pan,IME perfuse collection pack,fearsome bear bottle and lunch bag,Lhami essential oil set,Karen Murrell lip palette. Our favourite Christmas tradition is setting up and decorating the tree with the kids, they love it!! And in term we love it ?. 123 Nourish Me Calm Kids Box. Super hard to pick really, they would all be amazing, thanks for a great opportunity to win beautiful prizes! We don’t have any real traditions but what I truly love about Christmas since having kids is watching their faces light up with the magic of Christmas it reminds me of when I was a kid and it’s a true blessing. A few years ago when my children were young and excited about what was under the tree (and impatient!!) we started having a “Christmas Eve” box. The box has Christmas PJ’s, a Christmas DVD to watch and some special treats for movie time. All the prizes look amazing. What an awesome collection of prizes!! I would love to win any prize, but especially the Solidtekniks fry pan, Life Changing Food book or Sensory Sound blocks. Oops, I forgot to mention our traditions! We open an advent activity to do together each day of December. Some of the activities are baking, reading Christmas books, decoration the tree, making decorations, etc. Generally my favourite thing about Christmas is spending quality time with the extended family. However, having a young family now with my 3.5yr old reaching her first Christmas that she fullly understands I’m hoping to start some Christmas traditions. Firstly I’m going to have her come into the kitchen and help me bake some lovely Christmas biscuits to share with everyone. A lovely way to learn to cook and have some Christmas fun all at once. No doubt her baby sister will be ready to join the fun next year. I would love the life changing cookbook, the solidtekniks sauteuse pan, the rainbow sensory sound blocks or the 123 nourish me calm kids box please. Aside from decorating the house/tree and baking , our favourite tradition is making candles from beeswax sheets that are rolled around a wick. I bought a pack a few years back and now we do it every year, early in December so some can be given as gifts to teachers/friends and the rest can be used at mealtimes – smells amazing! Such an amazing group of businesses. We celebrate Christmas by putting up a traditional tree and our Nightmare Before Christmas Tree. We also watch The Grinch and of course The Nightmare Before Christmas every year around Christmas eve. Oh and happy to win any of those gorgeous prizes! What great prizes . My families tradition is opening up all the presents christmas eve so christmas is just about family and the reason why we celevrate the birth of Our Saviour. Time spent together as an extended family with aunts ,uncles,cousins, grandparents,neighbours all bringing a plate, either savoury or sweet is the way we celebrate Christmas and have it as a tradition from one year to the next. Any of those beautiful gifts would be gratefully accepted. A favourite Christmas Tradition is putting up the Christmas tree listening to carols with the family. Baking xmas cookies for santa on xmas eve, so much fun with the kids, getting messy, xmas music on and of course something yummy to eat! Our favourite Christmas tradition is always having a Christmas pudding, as well as stewed apricots from the new season apricots and icecream for dessert. I am now in charge of the Christmas pudding which I took over from my Grandma, and involves soaking the fruit in Brandy for 6 weeks before cooking! As my kiddies are little (eldest is 4), we are creating new Christmas traditions. It’s all about spending quality time together, having fun & being kind to each other. Our favourites are decorating the Christmas tree together whilst we sing Christmas carols, counting down the days using a beautiful diy advent calendar filled with acts of kindness & activities to do together (& a few crafty gifts to help make those Christmas gifts & cards), making NNAM reindeer food together & sprinkling it on the grass on Christmas Eve. Getting together with friends & family for festive carols by candlelight in the park and of course sharing beautiful food & gifts with our families. The making of the gnocchi. Pan, razor, deodorant, chocolate hamper. Christmas light hunting on Christmas Eve! And leaving out almonds and strawberries for Santa’s snack (which everyone else thinks is ridiculous)! I’d be happy with any one of these lovely prizes ? Carrots and celery for the reindeer. If not left out, Santa might not be here! Family tradition, thats oh ! so much fun. On the first of December we put the Christmas tree up as a family. Then we go for a walk around the neighbourhood and check out the Christmas lights. This year my daughter is old enough to kind of understand what Christmas is all about so we have started the tradition of a reverse advent calendar where each day we put a non perishable food or personal item in a box to be delivered to a charity. I would honestly be so happy with any of the gifts as we have had a busy few months and we haven’t had much time or money to spend on ourselves and if it something we cannot use it will make us happy to donate to someone who can. I love hearing everyone’s traditions. Ours is a homemade advent calendar with family activities each day. The first one is always getting out the Christmas books! I would love the Karen Murell Lip palette, the Solidtekniks pan, the Parker razor or the spiralizer please. What an amazing giveaway! My family Christmas tradition… When I first met my husband, I cooked my first Christmas pudding in a pudding tin (the whole boil on stove for 5 hours thing), and it came out of the tin perfectly. Beginner’s luck! I have tried the exact same recipe every year since (11 years now) and have not been able to repeat this feat. Still, it has never gone to waste… And I will continue to try every year, whether I master it or not. We have blended a family, so have started our own new traditions as of last year, and shared our old ones! Something I really love is each picking a new wooden Christmas tree decoration and writing our names and the year on the back. I look forward to reminiscing about lots of happy memories in years to come ? My top four would be the wooden sensory toys, the lip palette, the razor, and the frying pan. Thank you, and Merry Christmas ? We open one present on New Years Eve. We normally do this after Christmas mass. I cannot remember a time we have never done this!! I grew up in Poland so my Christmas childhood memories are much different to the most of Australians. On Christmas Eve morning we set up our Christmas tree and mum cooked all day. We had all the traditional fasting dishes like boiled dried peas and beans, fish, sourkraut and dried mushroom soup. Before supper the kids had to go outside to look for the first star of the night which was the sign to sit down to eat. Meanwhile the presents would appear under the Tree, we missed Santa again! Dinner had to have 12 dishes, we would substitute with condiments in lean years. There would be a white table cloth under which a little hay was placed to remind us about the original barn where Jesus was born. After dinner we all sang Christmas carols. This year I will be specifically reminiscing about my dad telling the same story each year about the carols sang at his village church when he was young. He would take on the women’s high pitch voices and then the men’s loud manly reply. My dad passed away last Easter and even though I haven’t spent Christmas with my family in Poland since 2003 I’m sure he would have told the same story each year. I will be remembering my Polish Christmas while sitting down to a totally opposite weather and a foreign tradition on Australia. As I was reminiscing I forgotall about the awsome prizes. I’d love to win the Erica Brooke pack, followed by the Lhami essential oils and the little perfume set. Thank you! Hi. What a great list! To be honest Christmas tradition is just about eating all day with family. For us it isn’t about the gifts, don’t get me wrong gifts are great. But our focus is Christmas lunch, everyone coming together family, extended family, and this year our first grandchild, sitting together at the table sharing a beautiful meal. And these prizes are amazing, you couldn’t pick just one. But at the top of my list would be the cookbook or the pan. Our tradition is putting on some Christmas carols – all types from traditional choirs to 50’s types and jump around while we do all the food prep – lots of lovely smells and joy. The prizes are all so wonderful it would be difficult to choose. We always had a real tree at Christmas. We have just had a baby so im bringing the tradition back. Our Christmas traditions are Prawn Dip, our own ham & making Honey Buscuits! The prizes are all magnificent & it would be an amazing Christmas Gift to welcome any of them!! Thanks NAtural New Age Mum for the opportunity & spreading Christmas cheer!! Oh my goodness those prizes are amazing!!! I would love any of them, probably top two would be the solidteknics pan & the life changing food cookbook. I am a bit of tragic for Christmas decorations, now I have x2 young boys I love getting them and my husband to help putting up the tree and decorations while we listen to christmas carols. My favourite tradition is our boxing day lunch (not always on boxing day but a few days after Christmas!) the whole extended family head up to a family members farm, everyone brings leftovers and we have a relaxed catch up, the kids run wild, tents get pitched, it can last for days. What great prizes! Thank you! I would love love love Solidteckniks, Amazing Oils Vanity pack, Erica Brook deodorant pack or Life Changing food! So many wonderful prizes. Our non negotiable Chrissy tradition is putting the tree up the first weekend in December. We play carols, argue about ornament placement and yhen watch a holiday movie in the glow of the tree lights. We have a great tradition on Christmas eve- a bbq pool party at our place then a wander up the road to admire the Christmas lights in a local street. The next morning after opening our gifts we head to the beach for an early morning surf before we get ready for our big lunch. Gosh I’m a softy, i just start thinking about Christmas traditions and i get a lump in my throat. I love love. Love the magic and sharing it with others. My favorite tradition would have to be sitting on the couch on Christmas eve, just before the kids go off to bed, chddling and reading them a Christmas story while they sit their in their Christmas pyjamas. It’s so simple but so special. Sometimes hubby snaps a pic of it. I love that they run to choose a book each year. It’s just beautiful. Prize wise, they all look wonderful! 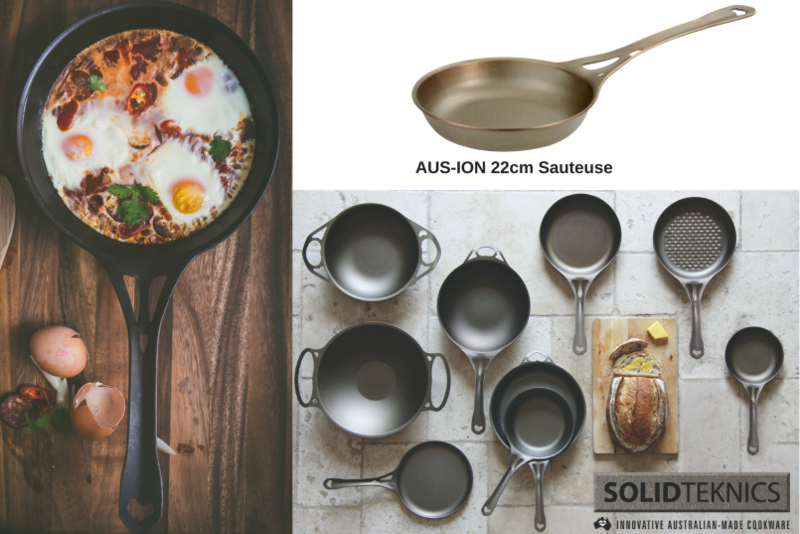 Hubby and I have been drooling over the Solidteckniks range for ages now and want to replace all our pans and pots with them. So they are number 1!!! I also like the vanity pack, perfumes and heart chakra tea. Spiritualitea is a fabulous concept and I already have all tbe chakras so would gift this to a loved one. We love going to the Christmas markets and watching Christmas movies. There is only my husband and I, we have his 95 and 92 year old parents and my 85 year old dad here for Christmas lunch. My special Christmas lunch always includes mum’s salad dressing (made with condensed milk) and mum’s wine trifle. All the gifts look wonderful but if I had to choose, the Sauteyse pan, the essential oils, the perfume collection and the necklace. My Christmas family traditions are putting up the Xmas tree during the first weekend in December, getting together on Xmas day/Boxing Day with extended families, and taking our kids around to look at all the Xmas lights. All of these products are amazing it would be very difficult to choose my favourite! Thank you for such a wonderful give away with everyone’s favourite products! Our little family spend Christmas Eve at my parents house – our daughter gets to open a Christmas eve present of new PJ’s, we watch Elf, put out the reindeer food and ” Ho Ho Ho’s” mince pie & beer before bed. In the morning the wonder of the left over reindeer food & Ho Ho Ho’s half eaten mince pie is just the best! It’s then croissants, strawberries & a cheeky chocolate before opening a few presents before everyone else starts arriving. So much fun! After our Christmas lunch we all play games, cricket with the kids or cards or board games, its always fun whatever we play. Even though are kids are all grown up and independent we always get together (even if it’s not Christmas Day), play Christmas carols and open presents together. The kids usually sitting on the floor amid piles of wrapping paper. Always a fun and loving time. Our favourite Christmas tradition is making a delicious plum pudding (using the recipe my Nanna passed onto me) and making a wish as we each take a turn to stir it. Then on Christmas Day, the whole family gets together for lunch that lasts all afternoon…..it’s just a super relaxing awesome day! Putting up the Christmas Tree on the 1st December. Everyone is so excited that Christmas is coming. Unfortunately, no one wants to help dismantle the tree on the 1st January. Would be happy with any of the prizes but would particularly love the Avant Spiretti. 2. Lhami Essential Oil Kit. 3. IME Perfume Collection Pack. 4. Life Changing Food Cookbook. A homemade Christmas pudding – following Great great grandma’s recipe with coins that are at least 70 years old hidden in the pud! Even as adults we love finding the coins! My dad always cooked ham and eggs on the BBQ for breaky, his special touch was sprinkling garlic chives he had grown all year on the eggs. Well dad passed away when I was 25, I’m 45 now and have managed to keep his garlic chives alive for 20 years to keep this tradition going! I can’t wait for Xmas breaky! 3. I am a long time Ayurveda follower so I would love the tea. 4. Who doesn’t love chocolate after yoga ? Wow, great prizes on offer! Great to see women trying to make a difference to us living healthier lives. I just did one of my favourite Christmas traditions yesterday. The giving of bunte teller on St Nicholas day. Bunte teller is German for colourful plate and is a gift of home baked goods, seasonal fruits and nuts. I spend a week baking leading up to St Nicholas day (Dec 6th) and then put together pretty caddboard boxes filled with bunte teller items, and hand them out to my kid’s teachers and school. It’s a long held family tradition and my grandparents did it, my parents and now me and my kids. A very common and loving Christmas treat. And please Santa may I have some Solitechniks! Our family is very small here in Australia as my parents emigrated from England. We spend every Christmas Eve at the house of one of our adopted Aussie family – we eat pizza, watch the Christmas carols on TV and celebrate life, love and friendship. Then on Christmas Day (which includes another adopted aunty and uncle who have no other family) we always have a traditional roast lunch – turkey, pork, roast vegetables, gravy and all the trimmings. The men always do the dishes after lunch as the women have done all the cooking. My mother buys a game of some sort for Christmas every year and we spend the afternoon playing this game as a family. We generally spend the evening together as well and then everyone gets to go home with plates full of the food that is left over from lunch. My favourite Christmas tradition is on boxing day, we pack a picnic lunch and head out to a local national park area that has a heap of caves and bush walks. We go for a walk sit in the sun and relax completely away from technology and reconnect after the huge build up to Christmas and all the chaos that ensues on the day. Every year we watch national lampoons Christmas vacation, buy the current year ornament and gift each other a chocolate orange ?. It was the best a couple of teenagers could do! My favourite Christmas tradition is to watch the kids open their presents from Santa and then the eat breakfast as a family. Love seeing the excitement on their faces. It’s had always been letting the kids put the Christmas tree up. Even thigh I’d ready like it perfect with ornaments in perfect place. I find that letting the kids enjoy the excitement of it all is perfect enough for me. We make a Gingerbread House and decorate it each year. We invite friends over and make a happy day of it. We also watch the snow man movie. My husband did this with his family as a child and now we do it with ours. Our family Christmas tradition is to harvest the garlic that we planted back in Autumn. We all get out there, harvest it and put them on racks to dry them. We grow enough to last us all year. It’s so special to see my 2 boys harvesting and learning all about how food is grown. Would love to win the SOLIDTEKNIKS 22CM SAUTEUSE PAN ? I love all of the amazing things you are giving away. My favourite family Christmas tradition is our family Christmas lunch we spend with my cousins. It’s always joyous and full of love and kind spirits. I love it. As my husband is always working on Christmas Day (truck driver) our family traditions are ever changing! The one thing that never changes is that we all spend as much time together as we possibly can! As for the prizes? They are all amazing! I would feel grateful and blessed to receive any, and might be conveniently leaving this browser window open for certain people to see 😉 *hint hint* ?? We’re adding to our christmas tradition this year with the kids each buying a gift from their pocket money for another child that may be not as fortunate as we are to put under the giving tree. It’s really important to teach them that no matter how much or little money we have we can always give a little in a small way. My newest and favourite tradition is putting together a bag or box for a charity and filling it with necessities and goodies. This year I chose to support Share the Dignity’s It’s In The Bag and find it to be the best, most important thing I do at Christmas time. Nothing greater than the gift of giving, especially to those who need it most. Thanks for such an amazing giveaway. MIND BLOW. We’re very spoilt. Wow! What an amazing giveaway! I’d be super excited to receive any of these prizes!! Ah, Christmas… how I love you! With three kiddies under 5 we’re starting some wonderful family traditions… Christmas tree decorating in our crazy Christmas hats, picnic dinner at our local carols, movie and popcorn on Christmas Eve, and our crazy elf, Simon’s antics! Such a magical time of year!! I have a young family, so we’re still creating our traditions. One thing I’m starting on though is teaching about giving rather than receiving. I’d love the IME perfume as traditional perfume makes me ill. 123 nourish me also looks amazing. Our family Christmas tradition is a trip to the beach for a swim or surf, usually after breakfast and present unwrapping and before returning to eat ourselves silly! We also have the Christmas Eve tradition of watching “Love Actually” while doing last minute food prep, present wrapping and putting together kids toys. It’s such a generous list that everyone has offered, I’d be happy to win any of it – though the Quirky Cooking book would be amazing as we’re just starting on our GAPS journey for our two children who’ve had some health challenges in the last few months. As kids we used stay at my Uncle’s house, in this tiny little beach town for special holidays. With 5 kids, my parents couldn’t afford fancy resorts or hotels. We all have the best memories of this place. Now every 3 years, all 5 of us make it a priority to be there for Christmas. A lot of us still stay at my Uncle’s house too! We spend Christmas Day in the same spot at the river, even if it’s raining. We go fishing, go to the beach, and walk around hunting cane toads at dusk, just like we did when we were kids. My tradition is all my boys at home for breakfast. What great prizes, I would be happy with any of them. My most loved tradition is waking up super early to the kids on Xmas morning,the only time I like getting out of bed that early, watching their little faces light up unwrapping their gifts and the magic of santa. Thanks so much for this awesome givaway. Unfortunately we do not celebrate christmas. Which can be a relive as well. As family we like to spend time together with the kids, have a bbq and go fishing. As for the prizes. They are all great, but i have been eying those pans for quite some time and i really like the 124 norish me products, razor or spiralliser are great too. Mant thanks. We have our daughter pick a real Christmas tree and wear matching pyjamas. We also donate to charity every Christmas to show our daughter the true meaning of Christmas ! Our tradition would be my daughter deorating the tree early in Dec & out for lights sight seeing. Lots of amazing prizes,would love any but if pressed to choose…. Saucepan (sorry I know 5)?? Our Christmas tradition is putting up our tree. The start of December sees us untangling lights, decorations and tinsel!! The kids and I love putting all the baubles up and the star on top is the highlight!! The first one of the year is putting up the Christmas tree with my son. He wears an elf hat, I put up the tinsel and lights, he hangs all the decorations on the tree. We also have special decoration for each of my grandparents who have passed. They represent their personalities ? My favourite Christmas tradition is putting up the Christmas tree with the kids, listening to Christmas music amd decorating the house. My favourite tradition is putting up the Christmas tree. What this looks like has changed as my kids have grown older. They have taken on more of the responsibility and it has been wonderful to watch. The Christmas baking, singing of carols, helping others and attending a carol service are all very special to us too. All the prizes are amazing. Thanks for organising it. My preferences would be Solidtekniks pans, Karen Murrel lipstick, Life Changing Food book, Amazing Oils pack. Thanks so much! My favourite tradition is lighting the Christmas tree candles at Mum’s place. She’s got a new (fake) tree this year that’s beautiful and we can’t wait for a beautiful feast of duck, seafood, ham and delicious trimmings before enjoying the tree with a glass of bubbles. I’d love to win the Solidtekniks or Jo’s Life Changing Food pretty please. We have a young family and have started on the journey of creating our own Christmas traditions. This year I made Salt Dough Ornaments with my preschooler. They’re a fantastic keepsake that we’ll be able to look back on every year. Very much looking forward to getting our youngest daughter involved next year. ? Top 4 picks: Rainbow Sensory Sound Blocks, Life Changing Food, Solidtekniks Sauteuse Pan & 123 Nourish Me Kids Box. Thanks so much for putting together such a fantastic collection of prizes! Wow, what awesome giveaways! As a child I didn’t have any Christmas traditions as such. So now with my own family have started our own as I feel that’s where a lot of memories are made, hopefully joyous ones! We decorate the tree together and every year take turns to put the star on top. Each child has their own ornaments that we have collected over the years that eventually they will take when they have their own tree. We have an advent calendar that we take turns and inside is a gratitude note from someone else in the family (as well as a haighs chocolate). And one I’m starting this year is the last one up gets to open the first present (hopefully they sleep in!) I’d love the saucepan ? My favourite Christmas tradition with my 3 boys is baking for Santa. Every Christmas Eve we make gingerbread dough, the boys roll and cut shapes and then decorate. They each make one extra special one for ?. This simple activity together is so special. All these prizes look amazing! Our love our tradition of giving the kids a December box full of fun Christmas things. This year we put in books, shirts, puzzles, stickers and a Christmas toy. So much fun! A family tradition I was brought up with and loved is having Christmas Day at home with my siblings and parents. Small group, family fun day and no one having to go anywhere. We still do this every second year (living interstate) now with my parents, and also with husbands and our children. Now we all arrive by mid morning and leave after dinner. A very relaxing day. It’s so hard to choose in the prizes, but would be happy with any. My favourite prize would be the gorgeous karmic star chakra goddess necklace, followed by the ime perfume or the solidteknics. I started a tradition last year with my boys, instead of having an elf on the shelf we have a Christmas Mouse. He hides every night and they have to find him in the morning. I didn’t think they were that into it last year but this year they easily awaited his arrival. Only problem is, I can’t find the Christmas Mouse! So a replacement raindeer has had to step in. A favourite Christmas tradition is a lovely breakfast for the 7 of us, before organised chaos starts. Each of the 5 children get to pick a favourite breakfast food to have and we all get to sit down to some sparkling apple juice in special glasses as a treat! We have kept up the santa sack tradition from my family however it’s changed a lot from jam packed full of junk food and crappy toys to a few small gifts of books and crafty things and healthy chocolate! Mine and my 2 son’s family tradition is making rum balls together. It’s ooey and gooey and of course oh so yummy and of course each batch has to be loveingly taste tested to make sure they taste fabulously delicious for everyone. Christmas is the one time of year where all our family from right around Australia come together in one place. It’s always a big event. Everyone is responsible for bringing a portion of the food to be eaten on the day, and until my step dad usually acts as Santa to hand out the presents. Now he’s passed away, the task now falls to my brother. This is also the one time of year where I let my kids have canned whipped cream squirted into their mouth. The absolutely love it. I would be happy to receive any gift, but here’s my favourites. Thank you for organising this giveaway. I have shared it in my newsletter and also on facebook. We have an annual family Christmas day water fight…part of the morning is spent each preparing the a stash of water guns and buckets (not more water bombs as they are too much waste). All the prizes are amazing and generous, but I love the Solidtechniks, the rainbow colour blocks, and the life changing food cook books. I have decided to start a new tradition this year of doing a family Christmas jigsaw puzzle. It’s the one time of the year where we have more time to sit and enjoy some slow time doing a puzzle together. I have just found out that my youngest seems to have some allergies as well as my oldest boy. I have been eyeing off the life changing cookbook for a while now so would love to sit down on Christmas Day with it. Merry Christmas to you all. My family’s favourite Christmas tradition is to have a day of absolute rest. We don’t pressure each other to catch up on Christmas Day but we all know we’re welcome at each other’s houses. It’s bliss to know you don’t have to do anything except relax and unwind. When I thought about our Christmas traditions, I realised how many we actually have. On of my favourites is my mum always had gardénias on the table and so does my nan, just the smell of them makes me smile and think of family at Christmas time. I’m trying to grow my own so I can continue this tradition. I don’t think I could pick only four but quirky cooking and solid technics would be high on the list. Thank you for the chance. Our tradition is to put the tree up on 1st December and the little one gets to put the Star on the top. She gets to decorate it how she wants. We dont care what it looks like. Then we stand 1 moment in silence to respect those that have passed and cannot be with us. Our family tradition is watching the carols together on Christmas Eve. I love this time together ? We move over Xmas every few years so we try to have portable traditions. We have an Xmas eve box which we have PJ’s, a family movie and raindeer food for the kids to spread out. We also go xmas light hunting on Xmas eve each year. Each year I make up my Mums traditional boiled Christmas pudding minus the coins that she puts in hers. This year is the first year that Hubby hasn’t been with us for Christmas Day ( deployed) so it will be a very low key year for us. Every year we go to my parents house for the afternoon and evening and listen to the same vinyl record while we open our presents in turn sitting in a circle before sitting down to my dads christmas dinner which is to die for. We have a book advent calendar, where our two children take turns opening a new book every night in December until Christmas Eve. It’s exciting and fun, and we get to read new books snuggled up in bed. I’d be happy winning any of these incredible prizes, just as others would be too, no doubt. Happiness and cheers, to you. Growing up my mum, sister and myself would sit around the Christmas tree on Christmas morning eating crosants while mum handed out the presents. Now I do that with my husband and 2 kids but this year will be 3 kids as we welcomed our third bubba in April so will be his first Christmas. We also open a box the. Iggy before with pjs to wear and a book to read together. I would love any of the amazing prizes. Merry Christmas ? We don’t really have any traditions as such but my mum has seen my 3 kids each a cure little santa sack forntyeir first Christmas. I suppose the tradition beginning is filling those each year. I also LOVED visiting the Christmas lights so now that my kids are just that bit older (oldest is nearly 4) we will make sure to visit them every year so they can experience the magic too. I would be incredibly grateful to receive any one of the prizes on offer, they are all fantastic!! We don’t really have any traditions as such but my mum has sewn my 3 kids each a cute little santa sack for their first Christmas. I suppose the tradition beginning is filling those each year. I also LOVED visiting the Christmas lights so now that my kids are just that bit older (oldest is nearly 4) we will make sure to visit them every year so they can experience the magic too. When my children were young, we always read “the night before Christmas” and left food and a drink for Santa on Christmas Eve. ? Preferences for the lovely prizes is: Amazing Oils Vanity Pack, Solidtekniks sauteuse pan, Avanti Spiretti, Karmic Star Chakra Necklace. Hi, my daughter and I like to take turns celebrating Christmas Day by one year at her house and the other year at mine. The grandchildren love it as each year I will have a different rescued animal. We also enjoy using the Webber barbecue compared to the oven, and have salads instead of hot vegetables. When my sister and I were little, my parents bought a Disney Christmas cassette tape (Donald, goofy, chipmunks, Mickey, etc). Every year at Christmas we would listen to the tape. Ive carries on the tradition and now have the CD for my kids and we still listen to it every year! We have family all over Australia so our tradition is to have a Skype link-up on Christmas day. We may be states apart, but during the link up we feel so close and enjoy a Christmas laugh. – Karmic Star Chakra Goddess necklace. As christmas day is hectic, our family tradition is leaving a present at the end of the childrens beds when they are asleep. It gets us a little bit of extra sleep before bombarding us in our bed!!!lol. They love it ??? The Christmas traditions our kids love are putting up the Xmas tree on dec 1st. Going out in the evening to see the lights on the houses and baking and decorating cookies for Santa. We love playing Christmas CD’s whilst decorating the tree. This year, I really hope to be completely organised BEFORE Christmas Eve so we can sit together as a family & watch a Christmas movie, instead of me running around like a headless chook (or turkey), trying to cook & wrap all the things. – My eldest daughter would live the necklace as she’s just getting into energies & wicca. – I’d love the Sautese pan. Thanks & Merry Christmas, Sonia! What a great list of prizes! Thanks for organising this draw, Sonia. My favourite tradition for us is taking our girls to the local carols. They are still young (6&4) so everything is exciting but I know we all love this evening out. Hard to choose my favourite four prizes but I think I’d have to say the chocolate pack first as I’m just recently dairy free and I haven’t tried that brand yet. I’d also love the Changing Lives cookbook, the Solidtecknics pan and the Erica Brooke deodorant. Every Xmas morning we play Nat King Coles Xmas album to wake everyone up. Then we make daiquiris after a small breakfast and start to prepare our lunch feast. Our family tradition for all special occasions (Xmas, Birthdays, Mothers/Fathers day) is to have a “special” chocolate before breakfast. It’s usually the persons favourite chocolate and we all get to share them. It is a simple tradition but the kids love sharing “their favourite” with the rest of the family. We each get to pick a Xmas movie to watch. I always pick Elf which is my favourite. We also love going to our local Xmas lights. Hard to pick but my fav prize would be the Life Changing Food cookbook followed by the Solidtekniks pan and Ime perfume pack. Thanks so much! Our family tradition is having my elderly parents come to my Jone with my two adult children and their children to have a traditional family Christmas lunch complete with presents . We endeavour to jeep this going to instil upon the younger generation the importance of getting together and embracing our old and new traditions. Your page keeps me up to date with new ideas and I appreciate learning them. Thank you. My favourite family Christmas tradition would be putting up the Christmas tree. A simple one I know but we put on Christmas carols and it really sets the spirit for the start of the season! These are great prizes ?. My faves would be the fearsome bear pack, eco tan, essential oils and the lip pallet. Our Christmas tradition is to have Christmas Eve dinner at my sister’s house, Christmas breakfast at my dad’s house and Christmas dinner at my other sister’s house. Lots of family together and lots of delicious food. Top 4 prize picks would be Solidtekniks, 123 Nourish Me, Life Changing Foods and Eco Tan. Wow!! One of our Christmas traditions is riding our bikes around our neighborhoods and visiting the Christmas light displays. This way we can speak to the owners and take our time exploring together. These prizes are incredibly generous! If I had to pick top four I think it would have to be the stunning goddess necklace, the deodorant pack, yogi chocolate pack for my kids and the spiraliser! We love opening up our advent calendar in the lead up to Christmas! The kids get excited every morning! Putting up the Christmas tree together as a family is a tradition we enjoy each year. Love all the choices, so I will be very gratefully to receive any of them. We always play board games after Christmas lunch, always great laughs and great quality family time. Our Christmas traditions are to go to carols, drive around with the kids looking at all the Christmas lights, and Santa likes to block off bedroom doors with streamers and flood the loungeroom with balloons. My favourite tradition is to watch ‘The Snowman’ on Christmas Eve with me son. I love to do this as I used to watch it as a child on Christmas Eve. It is a classic and really starts to feel like Christmas when we watch this. Oh and I would love to win any of the prizes (they’re all great), but would especially love the Solidtekniks pan, rainbow sensory sound blocks and the Life Changing cook book! Our Christmas tradition is driving around on Christmas Eve looking at peoples Christmas lights. The kids love it! I would love to win the eco tan pack or….. the Quirky cooking recipe book? Our Christmas tradition is going for a family walk in the evenings to check out all the Christmas lights! We have so much fun ooooing and ahhhing and seeing others in our Neighbourhood. We moved from the UK 11 years ago and our tradition of baked Christmas lunch had to change. It was just too hot. So my husband (and sometimes the kids but they are 13 and 15 now so priorities are different) goes to the Sydney fish market very very early on the 24th and he makes us seafood all day on the 25th. The 26th is a family meal with his brother and cousins and their kids coming round. Something we look forward to every year. Thank you for organising this amazing draw. My favourites are the solidteknik pan, the amazing oils, Jo’s cookbook or the perfumes. Thank you. Traditions are simple. Decorating Christmas tree with kids, early opening and exchange of gifts, simple seafood lunch and traditional Christmas dinner, followed by my Mum’s homemade plum pudding and homemade custard. Time spent with our loved ones! Sonia this all looks amazing. I’d be so stoked to win any of these amazing products. Love your work! 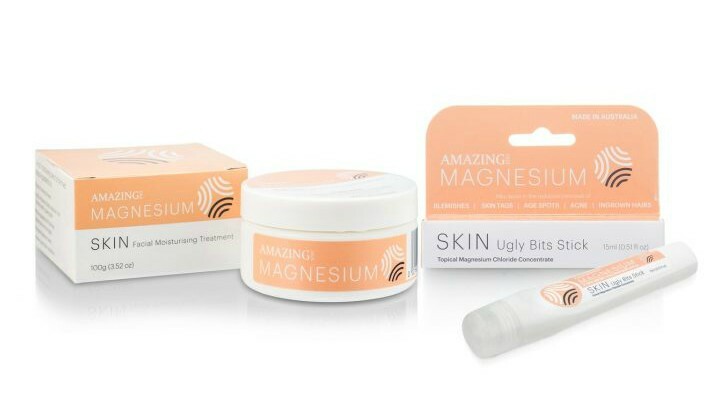 I’d love to win the skin tag removing cream, the natural deodorant or the sensory sounds blocks. We don’t really have any specific traditions as we like to mix it up a little every year. We do however have this beautiful wooden Advent calendar where a door gets opened everyday to a little wooden ordiment to be hung on the calenders Christmas Tree. We bought it when my first child was born and even though my kids are now 10 & 13 they still love it. Prize wise : Happy with anything but the Eco Tan Pack, Solidtechnik & Spiralizer would be great. Each year I let my children pick a special ornament for our Christmas tree and then they help me hang them. Also a new tradition is on Christmas Eve we have a box that gets opened with new pyjamas for whoever we are sharing Christmas with, a Christmas movie and popcorn. The children loved it last year so I will try to carry on this tradition. All of the prizes look wonderful. Thanks for the chance to win! Happy Christmas Sonia:-) Every year my family (which includes my mum, dad, sisters and families – 30+ now), dress up. It ranges from christmas footwear to full costume. Makes for the best family fun. One of our favourite family traditions for Christmas is heading to my parents after a big Christmas lunch with our other beautiful family. When we get there we spend the night catching up over Mum’s mango and prawn salad; we deliberately have a fresh easy dinner so we can enjoy focussing on catching up together. It’s wonderful to get that uninterrupted family time. We put on the Christmas vibes and roll them on a fork(similar to rolling gnocchi ). During this time we talk of the year and reminisce of past Christmases. I really look forward to this, because at this point its time to stop and smell the holly ????? One of my favourite traditions is waiting until 1 November to start playing Christmas songs … my daughters would play them all year round (and are so hilariously gleeful when they do sneak one in early). From 1 November it’s Christmas songs flat out! My favourite part of Christmas is a late breaky in the Botanical Gardens with my family and my parents… mum always makes something delicious and we have lots of fresh fruit. It is a lovely way to start Christmas Day for me. Christmas day is the one day when we let the kids eat whatever they like for breakfast. Mostly they forget and eat their usual meal. But they like it that they have a choice. Our favourite Christmas tradition is the Christmas Eve box. My boys are 10 and 12 and they still get so excited about this box every year. I put in a new pair of Christmas pyjamas, a new Christmas movie (although that gets harder every year, finding something they haven’t seen! ), and a treat for during the movie, and the boys open it on Christmas Eve. It is such a special time for us as a family. I would love to win any of these amazing prizes, but especially Jo Whitten’s amazing new cookbook, the perfume collection, the pan, or the Eco Tan. Thank you so much for the opportunity! My favourite Christmas tradition is having the family around eating Mince Pies and Christmas Cake just like Nan and Grandma and Mum used to make. We siblings have continued the tradition since our parents died and it’s now been 22 years of our version of Zealley Family Christmas. Thanks for the opportunity and Merry Christmas to you. Our family Xmas tradition is karaoke! We sing all the golden oldies from the 50’s right up to recent hits! We love connecting and expressing ourselves through music ?? merry xmas! Our Tradition is putting the Christmas tree up together and all the decorations and Christmas day lunch with family ? As I live up in the Kimberley and my adult kids live in Brisbane, every time we FaceTime is like Christmas to me, it’s very special. Our Christmas Day will be just my 10 yr old daughter and I this year so we plan to make it special with bon bons and silly hats and jokes. I don’t have a first 4 I have gratitude for this chance to win anything at all. The whole family gather to decorate our christmas tree. Most of our decorations were homemade at kinder or school. It’s great to reminisce about how each decoration came to be as we hang them up. Top 4 to share with my family: Rainbow Sensory Sound Blocks, Sauteuse pan, Fearsome Bear Goodies, Deodorants. Thanks. What a fabulous idea!! Our family gets together each year and my beautiful Mum and sister both dress up in gorgeous red dresses on Xmas day!! They always have a Christmas dress ready ❤️ Thanks for all your wisdom throughout this year! We all appreciate you! Our favourite family tradition is putting up our Christmas tree on October 31st. I know – sacrilege!! However we have found it’s a great distraction from Halloween which we don’t participate in. Now that Halloween and the mandatory chemical candy that comes with it seems to be every here in Australia, it’s a great way to have something fun and exciting to do with the kids on that day/night. ALSO – and most importantly!! It’s means almost TWO MONTHS of Christmas!! On Xmas Eve we will watch the carols on tv and once dark have a walk around the neighbourhood to look at the lights, then put out reindeer food and a treat for Santa before bed. Any of the prizes would be wonderful! Thank you! Merry Christmas! We have started up some new traditions to make this time magical for the littles (and bigs!). Our advent calendar is filled with ideas to help foster the true meaning of Christmas and Mr 3 loves the anticipation of counting down the days until Christmas and opening up the little scroll to see what message, task or act of kindness awaits. ?? Our tradition revolves around our advent calendar, each year the kids and I make origami stars and put one up each day on our count down to Christmas. This worked so well on our aubergine coloured wall it really looked like a starry night by Christmas eve. When the kids were younger I used to put a treat or an activity in the star for them to discover but as they have gotten older the star and count down is all they look forward to. We’ve continued this tradition even though we now travel full time in our caravan and it works as it creates such a chrissy atmosphere in our very limited living space. This is such a wonderful collection of prizes I’d be thrilled to win any and if it didn’t suit us I know it would suit someone we know – win win really. Our Christmas traditions include going for a beach swim Christmas morning, such an awesome way to start the day! We also do a trifle every year! My mum would do one just for my brother & dad & now I do one for my family. Love your gift ideas each year – thank you. One of my favourite family traditions is the advent wreath; each Sunday leading up to Christmas one more candle is lit at family meal time until they are all alight by Christmas. I’d love to win the Solidtekniks 22cm sauteuse pan, Amazing Oils vanity pack, Erica Brooke deodorant pack, or Life Changing Food cook book. Favourite Christmas ? tradition is driving ? around our community and seeing the Christmas lights, giving money to neighbours for charity and enjoying eating lollies while driving around. Such a lovely tradition. Would love 1. Lhami essential oils, 2. IME perfume collection pack 3. The Chocolate Yogi Chocolate Lovers Hamper, 4. Life Changing Food Cookbook. Thanks for the chance? We make my Great, Great Grandmothers Christmas pudding every year at Christmas. The recipe is over 100 year old. It’s a steamed pudding so is started to be made on Christmas eve. The recipe and how to make it is passed onto each generation. We change up and alter most of the food each year but the pudding is always the same. Our family tradition is ham & cheese croissants for breakfast at the beach. A few years ago I made Mary and Joseph out of clothes pins and felt; I hid them each night and the kids searched for them in the morning. (Then hid them for each other to find, staying entertained for a good hour each morning!) They still look forward to this each day, while I look forward to singing a carol each night, and sometimes reading a Christmas story too. Thanks to the generous sponsors who put together these goodies; they all look like lovely treats. 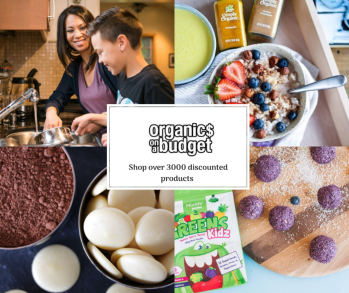 My top picks are: Life changing food; the deodorant pack; the spiralizer and the chocolate! Our tradition at Christmas is to find the best joke in the Christmas crackers/ bon bons and seeing whose head is too big to have the hat. It’s so much fun. I’d be happy with any gift thankyou. ? Hi our favorite Christmas tradition in our little family of 4 is our advent bunting filled with fun Christmas activities for every day of advent leading up to Christmas. This year we have also started having a wreath made by the kids and I with candles on our dining table that we light at dinner time and all share something we are grateful for – even my 3 year old is getting into it! we always celebrated as an extended family with a cooked lunch of turkey and ham and all the trimmings, followed by an afternoon lazing under the plum tree and playing rounds of backyard cricket…. A tradition used to do with my mum when I was a kid and I now do with my two kids is decorating the Christmas tree while listening to Christmas carols. A bit cheesy but I absolutely love it! So do my kids and they happily listen to Frank Sinatra and Michael Buble. And they let me sing along like a big dag! Favourite Christmas tradition is for each family to bake a different dessert from a different Christmas celebrating region/country (eg pernil asado, risalamande) each year. So there’s always something new on the table. But the most joyous tradition of them all, is to have all our dear and near together during this festive season! I’m not a big traditions person, but we do love going for a drive to look at the Christmas lights! I also love making handmade gifts and baking – fingers crossed my 1yo lets me this year! Treating myself to an ethical nitrate free ham is a more recent tradition too! 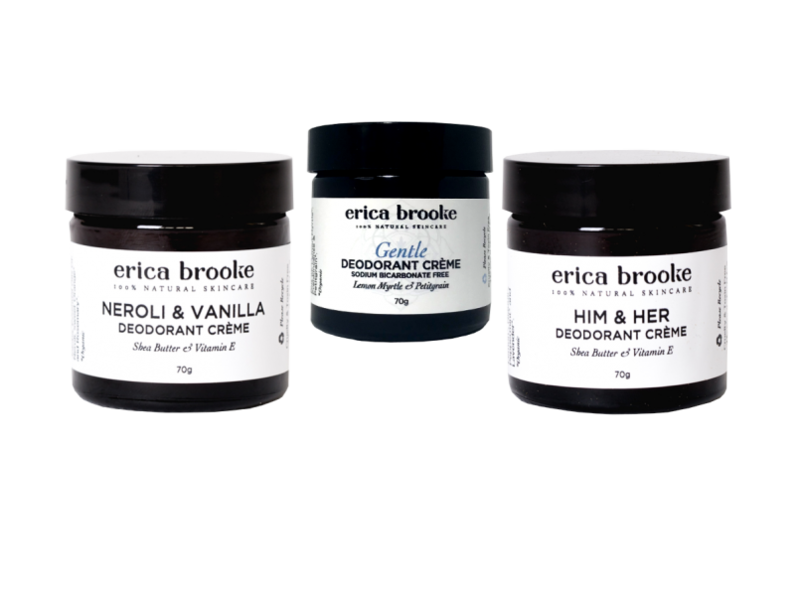 All the prizes are beautiful, but if I had to choose, the Erica Brooke deodorants are something I’d love to try. Followed by the solidtekniks pan! Also the gorgeous perfumes or the 123 kids set. Thank you for organising such a beautiful giveaway! Our most recent tradition is making something homemade to gift to family and friends. The past two years we’ve made body scrubs and they’ve gone down a treat. It’s made with love and process of making it is so fun! Thanks for the beautiful giveaway, so kind of you! Our tradition is driving around looking at Gold Coast Christmas Lights a few n8ghts before Christmas eve with Micheal Buble Christmas album playing loudly and us all singing together. So awesome watching the kids faces light up at all the amazing displays ?? Since I was a kid we’d play the Peter coombes Xmas album opening presents, a tradition I’m m passing onto my kids hoping they’ll love it as much as I do! Singing and dancing to carols while putting up the tree is a tradition in our house. We just love the excitement of Christmas. We decorate the tree on 1st December , leave out our Santa sacks milk , biscuits and carrots on Christmas Eve. Christmas Day lunch is roast with plum pudding and trifle. Dinner is sham and salad. We love our traditional Christmas!! I love going to Carols with the family, such a great night out. We love our Christmas lunches with the most important people in our lives, our families – mine on Christmas Day and my husband’s on Boxing Day. Amazing prizes! I would love to win the perfume pack, cook book, spiralizer or chocolate hamper. My favourite tradition is having my whole family (which is mostly not blood related) over on the 1st of December to decorate the tree together and have dinner. Adults do the lights and then all the kids put up the decorations – it gets very messy but very fun! The youngest one puts the star on the top and the oldest one turns on the lights once we’re done. Afterwards we all have a roast dinner and share stories. The next day I pick up all the bits of tinsel and bits of bonbon that accidently got pulled (they’re meant to be saved for Christmas Eve but only about half of them make it). My favourite tradition is walking around our local estate to look at Christmas lights. Thanks ?❤️? ?